In 2005, about 278 million people had moderate to profound hearing impairment; 80% of these people live in low and middle income countries.1 Causes of hearing impairment can include diseases such as meningitis, measles, mumps and chronic ear infections. Other causes include exposure to excessive noise, head and ear injury and ageing. Half of all cases of deafness and hearing impairment are avoidable through prevention, early diagnoses and management. Fewer than one in 40 people who need a hearing aid have one. The human ear is a very versatile organ. It can detect a huge range of sound pressures from a minimum of 0.000002 Pascals to 200 Pascals. Within a noisy environment it can tune into and interpret sound from a single voice. It is capable of providing a protection mechanism against loud, sudden noises. As the range of pressures which the ear can detect is so extensive, for simplification purposes this is normally compressed into a logarithmic scale in decibels. Table 1 shows some typical decibel levels for a range of situations. In subjective terms a change in noise level of 3 dB is just perceptible. A change of 10 dB appears to be twice as loud. In sound energy terms, however, reducing the sound energy by half only results in a 3 dB reduction. This demonstrates in some way the challenge of noise control, in that a considerable reduction in sound energy is required before subjectively there is even a noticeable difference in noise level. The human ear is sensitive to a wide range of frequencies. Frequency is defined as the number of cycles per second, or Hertz (Hz). The frequency range of human hearing is typically from 20Hz to 20kHz in adults with normal hearing. Humans are not equally sensitive to sound at different frequencies. They are less sensitive to low frequency noise and most sensitive to frequencies where understanding speech is important (500Hz to 2kHz). In physiological terms, the ear comprises the outer ear, which amplifies the sound as it enters the auditory canal to the middle ear. At the end of this canal sound reaches the ear drum. This is connected via mechanical means to three sets of bones – the hammer, the anvil and the stirrup, which amplify the sound. These bones are connected muscularly, and it is this which can allow them to contract in certain cases for loud sounds. This acts as a type of built in hearing protection mechanism for some loud noises. The middle ear is connected via the Eustachian tube to the mouth, so that the pressure does not equalise. If an infection occurs in the Eustachian tube, this can lead to temporary deafness. The middle ear transmits sound via an oval window connecting to the inner ear. The inner ear is liquid filled, and contains the semi-circular canals associated with balance and the cochlea. The cochlea is a spiral organ, at the end of which are the outer and inner hair cells. In terms of hearing damage, the outer hair cells tend to be most prone to damage as a result of exposure to excessive noise. The outer hair cells are thought to be important in analysing the direction of the noise source2. When these are damaged this function seems to be impaired, meaning that it is more difficult to tune into a particular voice within a noisy environment, which is one of the first signs of hearing loss. Also damage to the outer hair cells appears to affect the dynamic range of sounds which can be observed; that is, the range between the minimum audible sound and that which causes pain. Hearing loss as a result of age is known as presbycusis, characterised by loss of sensitivity to high frequency sound and is more pronounced in men than women. Exposure to a high noise level can result in a temporary loss of hearing sensitivity, often combined with a ringing in the ears. Removal from the noise normally leads to recovery. This temporary reduction in hearing sensitivity following exposure to a loud noise source is known as temporary threshold shift (TTS). If the noise exposure is sustained and continues before recovery occurs, a permanent noise induced hearing loss (NIHL) can occur. Hearing loss due to noise exposure normally starts at high frequencies, typically around 4kHz to 6kHz. This normally means that the ability to identify high pitched sounds such as bells, is affected initially, followed by increased difficulty in understanding speech with voices sounding muffled. It is particularly noticeable in noisy environments. The high frequency range contains information about consonants and these carry most of the information in speech. The lower frequencies carry information about the vowels. Although there may not be much reduction in the volume of the speech, the sense of the speech is lost. By the time the loss is noticed the NIHL is generally well advanced. In terms of setting hearing damage risk criteria, it is impossible to protect every person against any change in the hearing threshold across the entire frequency range, and therefore a compromise is normally required. The aim is normally to protect most individuals in an exposed group of employees against loss of hearing for everyday speech. For speech recognition the frequency range 500Hz to 2kHz is critical. In the US the loss for speech recognition is related to the average of hearing loss in dB at 500Hz, 1kHz and 2kHz. Australia uses the weighted mean loss for 500Hz -6kHz. The arithmetic average of 25 dB loss defines the boundary between just adequate and inadequate hearing sensitivity for speech recognition. A 25 dB loss in hearing allows speech to be just understood satisfactorily. A loss of 92 dB is defined as total hearing loss. Between these?ranges 25-92 dB hearing is said to be impaired, with a percentage of 1.5% hearing impairment for each dB above 25 dB. Data shows that permanent threshold shift is related to the level and duration of noise, but there is no information regarding the effects of variable noise level during exposure. A damage risk criteria of 90 dB for continuous eight hour exposure (broadband) produces a hearing loss of 25 dB averaged over 500Hz, 1kHz and 2kHz for 25% of the population exposed for 30 years or more, approximately. An exposure of 80 dBA constitutes a negligible risk for speech, therefore the aim is for 80 dBA or less in any plant design. Above this there is a compromise between the cost of noise control, the risk of hearing damage and compensation claims. Studies show that for 97% protection of the population at all frequencies, noise must not be greater than 75 dBA. The equivalent level for 24 hour noise is 70 dBA. Most countries recommend 85 dBA for eight hour exposure, although 80 dBA is better for minimising hearing damage. Regulations in some countries lag the standards and there are not many instances where the maximum level of 85 dBA is enforced. Most countries have an upper limit of 90 dBA due to the economic implications of meeting 85 dBA. The EU has recently set the upper action level of 85 dBA with a lower action level of 80 dBA, with an upper exposure limit of 87dBA for an eight hour working day3. At the upper action level hearing protection is required and warning signs are required. Also, audiometric testing is to be made available to employees. At the lower action level hearing protection must be made available and training on how to use it given, along with audiometric testing. In terms of addressing the issue of noise control and potential hearing risk, initially a noise survey should be conducted at the place of work. This can be used to establish areas within the workplace which exceed the noise limits. If workers do not stay in the same general area then they will need to wear dosimeters, a type of ‘noise badge’ to measure their exposure throughout the day. Once the noise levels have been established around the factory, comparison with the noise criteria will set the levels where workers are exposed to high noise levels and the quantity of noise reduction required. This can assist in determining suitable noise control measures within the workplace. The means for noise control very much depends on the source of the noise and the nature of the noise generation mechanism. • Control of noise at source - This tends to be the most effective means of noise control. This may involve maintenance of the machine such as repairing faulty bearings. Often a noisy machine is a symptom of it operating inefficiently and so attending to the source of noise can also have benefits in terms of the machine operating more efficiently. It may be possible to limit when the machine runs under certain conditions, such as at different speeds, if this reduces the noise level. If machinery is being replaced, selection of a quieter machine can be considered. • Obstructing the path between the noise source and the receiver - This may include the use of screens or barriers around the noisy machine. Also, the addition of screens or guards to control the noise may be appropriate. These measures may limit the area affected by the noise so that only the operator requires additional hearing protection. Depending on the layout of the factory, it may be possible to reduce internal noise levels by the addition of absorption to the factory. Absorption may be added in the form of sound absorbing screens, wall panels or suspended ceiling panels. Depending on the room layout and amount of existing sound absorption within the room, the addition of absorption can potentially reduce the noise level by up to 3 dB. • Increase the distance between the receiver and the noisy machine – This may be a way of changing the working practice, so more workers do not enter the noisy zones. Alternatively, there may be a means of managing the work routine so that other, less noisy tasks are incorporated within the worker’s day, so he/she is not exposed to higher noise levels. Generally, if a worker is exposed to a noise level 3 dB above a target noise criteria, they need to reduce the time for which they are exposed by half to meet the criteria. • Enclose the worker - In some very noisy environments, it may be possible to build an enclosure effectively around the employee, so the operator has a refuge from the high noise environment. An acoustic consultant can assist in the specification for the design of this quiet space, although there are off the shelf cubicles supplied by manufacturers. This can provide very good reduction?in noise levels, but may not always be practical in terms of the work process. Alternatively, the provision of a quieter space for part of the day in which to conduct other work activities can assist in reducing the overall daily exposure for an employee. • Ear plugs - These are used to block sound entering the ear via the ear canal. There are a number of different types. The foam variety is generally disposable. These are compressed and placed in the ear canal where they expand. Also, there are solid moulded ear plugs (non-disposable) available which are moulded to the individual’s ear-canal. Generally, ear plugs provide slightly less acoustic protection, but have the advantage that they are not bulky and do not affect other protective equipment. • Headphones – These enclose the outer ear and provide attenuation by a solid enclosure around the ear, normally constructed of plastic with typically a foam insert within the ear mould. These usually have padding around the ear for comfort. Generally this type of hearing protector provides more attenuation than ear plugs, but this depends on the individual product and manufacturer’s specification. They are potentially bulkier and may be more uncomfortable. Also, their performance can be affected by wearing glasses or safety glasses, hair and jewellery. In addition, headphones are available attached to hard hats, where these are required for safety reasons. Headphones can be used in conjunction with ear plugs to improve performance. With all hearing protection, the workers need to be trained in their effective use, as their performance is critical to the protection being used correctly. Often hearing protection needs to be such that it permits basic speech communication, to allow the worker to function within the work environment, while blocking much of the external noise. This can be achieved by selection of the correct performance hearing protection, so it is not over attenuating the sound. Over specification can make speech communication difficult and also make hearing alarms more difficult. Also, depending on the site, safety may be a consideration, as people naturally use hearing for warning of moving plant or vehicles. Once the noise survey has been conducted, and a hearing risk established, a hearing conservation programme should be undertaken which is an ongoing process. In conclusion, this article has described the physiological properties of hearing and how this relates to potential hearing impairment. The hearing damage risk criteria generally used around the world are summarised. 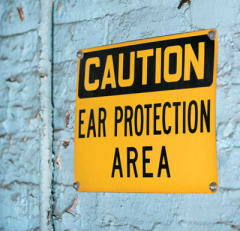 Some outline guides to noise control measures are given, along with some guidance on the choice of hearing?protection. The key issues which should be incorporated as part of a hearing conservation programme have also been described. In terms of future improvements in the assessment of potential hearing damage, the current emphasis is on how hearing damage can occur in the working environment. With increasing leisure time, however, people’s exposure to noise associated with leisure activities is increasing. This can include noise from many sources and is not limited to noise from discos, live music venues, but extends to the use of MP3 players. The latter is of particular danger, as people do not appreciate these can quite easily contribute to a person’s daily overall noise exposure. Hopefully, in future the assessment of a person’s total noise exposure will also include the contribution from leisure activities. Much of the problem is that the current noise exposure levels are as a result of research on people who have already suffered hearing impairment, so there is a delay between the occurrence of the hearing damage and the incorporation into legislation. There is a real risk that the current hearing damage may only be scientifically measured, say, in 25 years’ time. In the meantime, it is hoped at least that as part of the education process of people potentially exposed to workplace noise, they are also informed about the potential contribution of leisure noise on hearing damage. Principal acoustic engineer with Mott MacDonald, Max Forni is a Member of the Institute of Acoustics and is a Chartered Engineer with more than twenty years’ experience in assessment of noise and vibration issues associated with infrastructure and planning schemes, from environmental assessment and design stage to completion and operation. Contact max.forni@mottmac.com Maureen Marsden is a Member of the Institute of Acoustics with 15 years of experience in acoustics, including building and environmental acoustics. At the time of writing Maureen Marsden was a senior acoustic engineer with Mott MacDonald in Southampton, England. For more information log on to www.mottmac.com With contributions from Dan Doherty and Andrew Monk-Steel at Mott MacDonald.